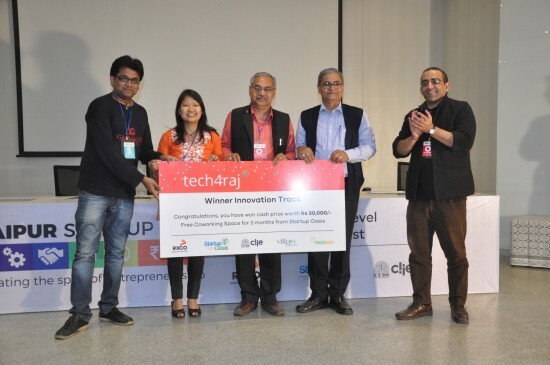 The one-day Udaipur Startup Fest came to an end today in the Lake City with the prizes being given for the Tech4Raj, Rajasthan’s largest social innovation and entrepreneurship scouting program. The prizes were given away by Chief General Manager, Mr Anil Sharma, COO, Startup Oasis, Mr Chintan Bakshi and Mr Anoop Mathur, DGM, RIICO. Chief General Manager, RIICO, Mr Anil Sharma; Founder and CEO of BOOND, Mr Rustam Sengupta; Co-founder and CEO of Thrillophilia.com, Ms Chitra Daga; Principal Secretary Industries, Government of Rajasthan, Ms Veenu Gupta; Chief Operating Officer of Startup Oasis, Mr Chintan Bakshi at the inaugural session of Udaipur Startup Fest today in the Lake City. Tech4Raj, the annual Social Innovation and Entrepreneurship program organised by Startup Oasis was launched on January 6th, 2016. Over 200 applications from across the country were received for the programme. Top 15 teams selected were taken through a mentoring program in collaboration with Pacific University, Udaipur. These teams presented their final pitches to a team of mentors on February 5 in the Bootcamp organized as a part of the fest. The prizes were given under two different categories – Innovation and Enterprise – today. Under the Innovation category, the first prize of Rs. 30,000 was won by Khushi Baby who presented their startup idea on wearable NFC (Near Field Communication) devices for infants which can track their vaccination record. The second prize of Rs 20,000 went to ‘Alligator Technologies’ who presented their pitch on Smart Stethoscope – a wireless stethoscope through which doctors can diagnose a patient in remote area. While under the Enterprise category, the first prize of Rs 30,000 was won by ‘Rural Ally ‘who presented their pitch on rural e-commerce method trying to develop a rural supply chain system by providing lucrative deals. The second prize of Rs 20,000 was won by ‘On the Farm’ who presented their idea of developing an app for virtual farming which is linked to real farm products. 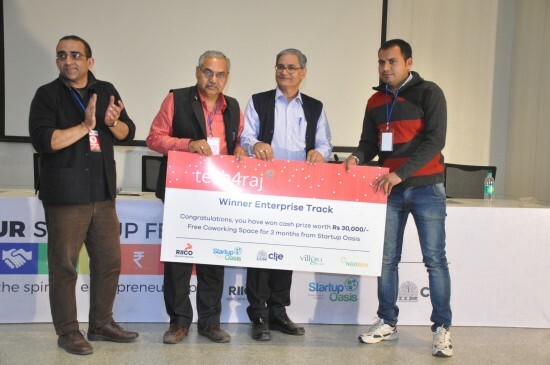 Apart from the prize money the winners will also get co-working space from Startup Oasis, Jaipur for 3 months and may get financial support from the Rajasthan Government under the Rajasthan Startup Policy if they fulfill all the required criteria. The Udaipur Startup Fest 2016, concluded with the Vote of Thanks by Mr Anoop Mathur. 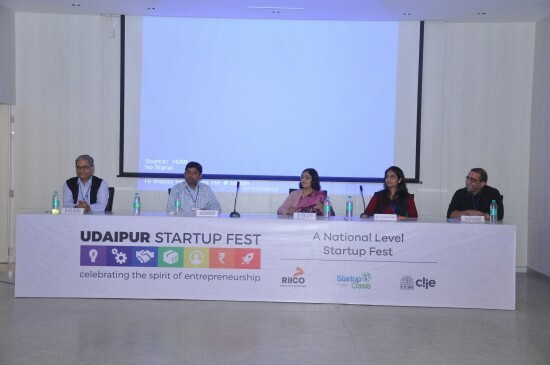 It is to be recalled that the national-level one-day fest was organized by Rajasthan State Industrial Development and Investment Corporation (RIICO) along with Rajasthan’s leading incubation center, Startup Oasis as a co-organizer. CIIE at IIM Ahmedabad also joined hands as knowledge partner for the event.